Here's a great resource I just stumbled across (hat tip to Alex Tinker). Sierra Club has compiled a Google Map (Google Earth version available too) of 138 proposed coal-fired power plants in the United States. Clicking each icon brings up lots of information on the proposed plant: when/where it was proposed, how big it is, where it's at in permitting/planning process, what actions have been taken against it, etc. 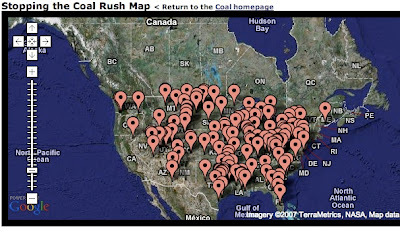 At first look, this map is frightening: 138 coal plants practically covering the map of the US. But after poking around and looking at a few of the proposed projects, one thing is clear: there are amazing and courageous organizations - Western Resource Advocates, Montana Environmental Information Center, Sierra Club, NRDC, Southern Energy Network, Rainforest Action Network, Global Exchange, Greenpeace, and many many more - fighting each and every one of these plants. Youth activists are at the forefront of many of these fights. And guess what: we're winning! Many of these projects have stalled, been rejected by courts or regulators or simply withdrawn after public opposition. But we've got to keep up the fight. The shear number of these proposals means we must be ever vigilant and resolute in our efforts to block the development of dirty, carbon-spewing power plants at the same time that we work to shift our nation's priorities away from our dependence on dirty and depleting fossil fuels and towards a sustainable, just, and prosperous energy future.